Smallest of the North African nations, Tunisia was a province of the Ottoman Empire until it was occupied by French troops in 1881 and declared a French protectorate. In World War II Allied forces converged on Tunisia from east and west and used it as the springboard for the invasions of Sicily and southern Italy. The country resumed its independence in 1956. 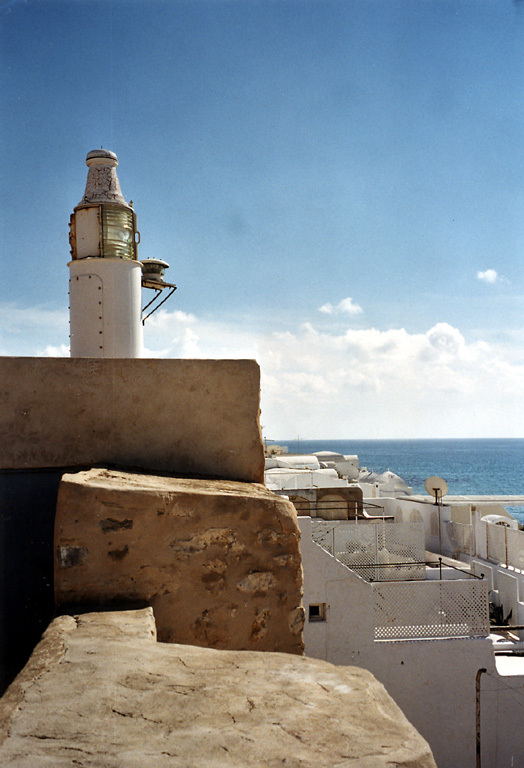 Most of Tunisia's lighthouses were built by the French within the first 20 years of their colonial government. 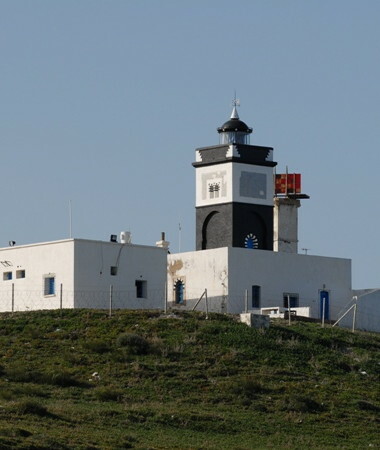 Today the lighthouses are maintained by the Service des Phares et Balises (SPHB), an agency of the defense ministry. It appears that most of them are maintained by resident civilian keepers with the original French lenses still in place. The Arabic word for a lighthouse is mnarh or manara (منارة). Ra's is the word for a cape or headland. ARLHS numbers are from the ARLHS World List of Lights. Admiralty numbers are from volume E of the Admiralty List of Lights & Fog Signals. U.S. NGA List numbers are from Publication 113. 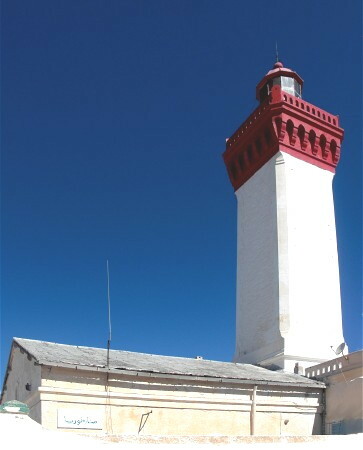 Article (in French) by Jean-Christophe Fichou on the development of Tunisian lighthouses. The article appeared in December 2010 in the Revue des mondes musulmans et de la Méditerranée. Photos posted by Alain Guyomard and Robert Carceller as part of their Phares du Monde web site. 1906 (station established 1891). Active; focal plane 72 m (236 ft); white flash every 2.5 s. Approx. 14 m (46 ft) tower with lantern and gallery, rising from a 1-story keeper's house. Tower painted white, lantern and gallery black. A photo is at right, Wikimedia also has a closeup of the lantern, Trabas has a distant view, Jordan Sudermann has a 2004 photo, and Google has a satellite view. The lighthouse is built on top of a 16th century fort built by Genoa. 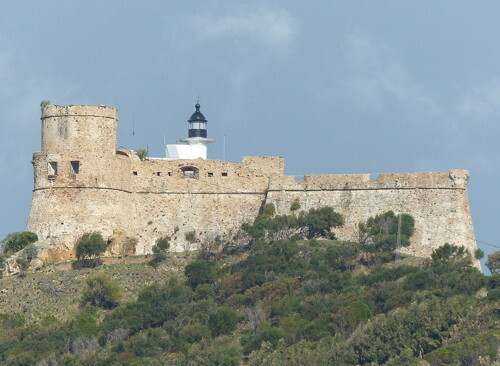 Located at the highest point of a former island (now joined to the mainland) that protects the harbor of Tabarka, near the northwestern corner of Tunisia. Tours of the fort are available. Site open, tower closed. ARLHS TUN-017; Admiralty E6460; NGA 22148. Date unknown. Active; focal plane 10 m (33 ft); green flash every 4 s. 8 m (26 ft) round cylindrical stone tower, painted green. Trabas has a photo, and Google has a satellite view. Located at the end of the north mole of the fishing harbor, just east of the Genoese fortress. Site status unknown. Admiralty E6462; NGA 22152. 1920. Active; focal plane 168 m (551 ft); four white flashes every 20 s; a continuous red light is shown over a narrow sector to the west southwest. 14 m (46 ft) square cylindrical tower with lantern and gallery rising from a 2-story keeper's house. Light tower and lantern painted black; keeper's house is gray with white trim. Giovanni Rinaldi has posted a photo, Trabas has a distant view by Capt. Peter Mosselberger, and Google has a satellite view. The Galite Islands are small, precipitous islands located about 30 km (19 mi) northwest of Cap Serrat. The lighthouse is perched on the highest point of an island at the west end of the group. Its construction was delayed repeatedly by high costs and engineering difficulties. Accessible only by boat. Site and tower closed. ARLHS TUN-016; Admiralty E6464; NGA 22144. 1890. Active; focal plane 199 m (653 ft); two white flashes every 10 s; red flashes are shown in a sector close to shore to the southwest. 13 m (43 ft) square cylindrical tower with lantern and gallery, rising from a 1-story keeper's house. Lighthouse painted black with a broad white horizontal band under the gallery. A view from the sea is available, Wikimedia has a very distant view, and Google has a satellite view. Located atop a steep bluff about halfway between Bizerte and Tabarka. Site status unknown (the lighthouse is in a remote area). ARLHS TUN-015; Admiralty E6458; NGA 22136. 1890. Active; focal plane 38 m (125 ft); white flash every 2.5 s; red flashes are shown in a sector close to shore to the southwest. 15 m (49 ft) square cylindrical tower with lantern and gallery, rising from a 1-story keeper's house. Lighthouse painted black with a broad white horizontal band under the gallery. Bekir Dildar contributed the photo at right, Antoine Sammito has a distant view, and Bing has a satellite view of the station. This is the northernmost lighthouse of the African continent, standing in latitude 37° 20.7' N. Construction began in 1888. Located on a headland about 12 km (7.5 mi) northwest of Bizerte. Site status unknown. ARLHS TUN-026; Admiralty E6456; NGA 22132. Date unknown. Active; focal plane 10 m (33 ft); two red flashes every 10 s. 8 m (26 ft) round concrete tower, painted red. Nizar Grindi has a closeup street view, and Google has a satellite view. Located at the northwest end of the detached outer breakwater of Bizerte. Accessible only by boat. Site and tower closed. Admiralty E6422; NGA 22076. Date unknown. Active; focal plane 15 m (49 ft); green light, 2 s on, 2 s off. 8 m (26 ft) round concrete tower, painted green (NGA says white with a black top, but this is an error). Nizar Grindi has a distant street view, and Google has a satellite view. Located at the southwest end of the detached outer breakwater of Bizerte. Accessible only by boat. Site and tower closed. Admiralty E6420; NGA 22068. Date unknown. Active; focal plane 15 m (49 ft); continuous green light. 8 m (26 ft) round concrete tower, painted green. A photo is at lower right, Gil Gautier has a photo, the lighthouse is at the center of a distant 2008 photo, Youssef Trabelsi has a closeup street view, and Google has a satellite view. 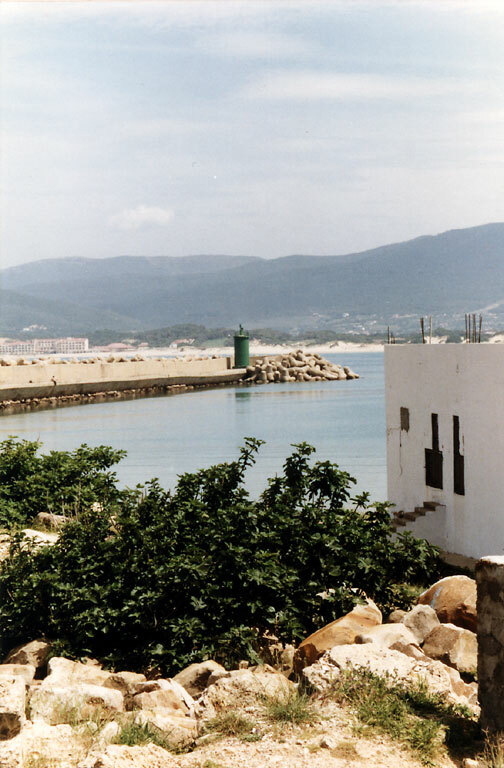 Located at the end of the north breakwater of Bizerte; accessible by walking the pier. Site open, tower closed. ARLHS TUN-014; Admiralty E6426; NGA 22080. 1914 (station established 1895). Active; focal plane 24 m (79 ft); red light, 2 s on, 2 s off. 17 m (56 ft) tower with lantern. The lighthouse appears to be unpainted red stone; lantern painted red. Hamza Hnini has a 2016 closeup photo, Wikimedia has Imen Bouhajja's photo, a distant view is available, Nizar Grindi has a distant street view, and Google has a satellite view. The height listed, 17 m, seems too low for the focal plane. Located at the end of the east inner jetty of Bizerte harbor. Site status unknown. Admiralty E6428; NGA 22084. 1895. Active; focal plane 16 m (52 ft); isophase white light, period not listed. 15 m (49 ft) square cylindrical skeletal tower with enclosed upper portion. Lantern removed. The enclosed portion is painted with black and white vertical stripes; the rest of the tower is painted white. No current photo available, but Google has a satellite view. This light helps guide ships through the Goulet, the short canal connecting the Bizerte harbor to Lake Bizerte. Located on a point of land on the north shore of Lake Bizerte that is aligned with the channel of the canal. Site and tower closed. ARLHS TUN-025; Admiralty E6440; NGA 22104. Date unknown. Inactive since 2011. 20 m (66 ft) round tower, rising from the port captain's office. Lighthouse painted white. No photo available, but Google has a satellite view. Menzel Bourguiba (named for Tunisia's longtime president Habib Bourguiba) is the former Ferryville (named for Jules Ferry, the French prime minister who sent troops to occupy Tunisia in 1881). Located on the southwestern shore of Lake Bizerte. Site open, tower closed. ARLHS TUN-030; Admiralty E6444; NGA 22108. 1860. Active; focal plane 39 m (128 ft); two flashes every 10 s, white or red depending on direction. 21 m (69 ft) round stone tower with lantern and gallery, rising from 1-story keeper's house complex. Lighthouse painted with black and white horizontal bands; lantern is black. Dilou Anis has a photo, Wikimedia has a historic postcard view, and Google has a fine satellite view. This is Tunisia's second oldest lighthouse; it was built by the British, with the permission of the Bey of Tunis, after the 1856 wreck of HMS Spartan stranded British soldiers on the island. The Îles Cani are two small islands about 12 km (7.5 mi) off Ra's Zebib, on the approaches to Bizerte. Located on Grand Île Cani. Accessible only by boat. Site and tower closed. ARLHS TUN-004; Admiralty E6416; NGA 22064. 1888. Active; focal plane 20 m (66 ft); two white flashes every 10 s; red flashes are shown over a sector to the west. 12 m (39 ft) square stone tower with lantern and gallery, attached to a 1-story stone keeper's house. Lighthouse painted with red and white horizontal bands. Wikimedia has Ahmed Abdelmoumen's photo, and Google has a satellite view. 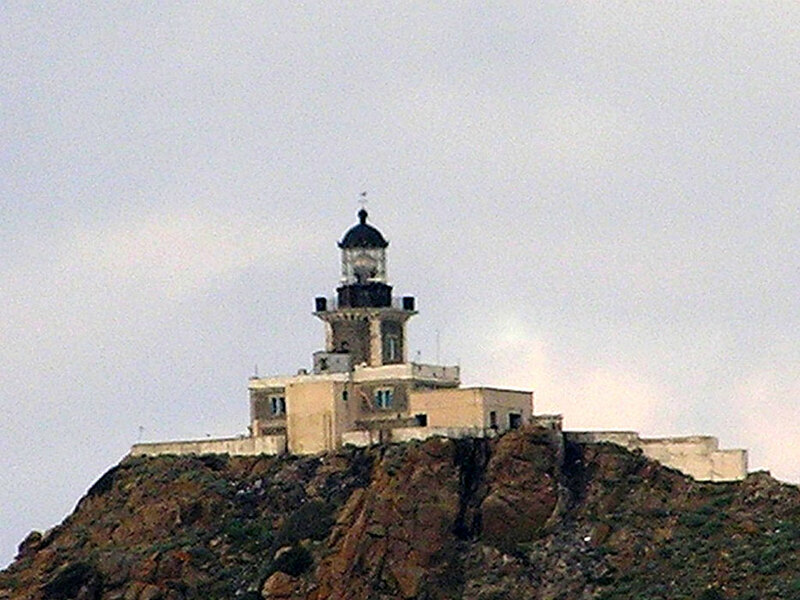 Endangered: the lighthouse looks abandoned in Mimiyou Zariouh's photo. Located on Île Plane, a remarkably flat-topped island about 2 km (1.2 mi) off Cape Farina (Ra's Sidi Ali el-Mekki) near Ghar el-Mehl at the northwestern entrance to the Gulf of Tunis. Accessible only by boat. Site and tower closed. ARLHS TUN-024; Admiralty E6414; NGA 22056. 1840. Active; focal plane 146 m (479 ft); white flash every 4 s. 12 m (39 ft) round cylindrical tower with lantern and gallery. Tower painted white with a black band at the top; lantern and gallery painted black. A photo is at right, Lightphotos.net has a 2013 closeup photo, Brent Scheneman has a photo, Trabas has a photo by Rainer Arndt, Huelse has a historic postcard view, Fares Bouhlila has a street view, and Google has a satellite view. 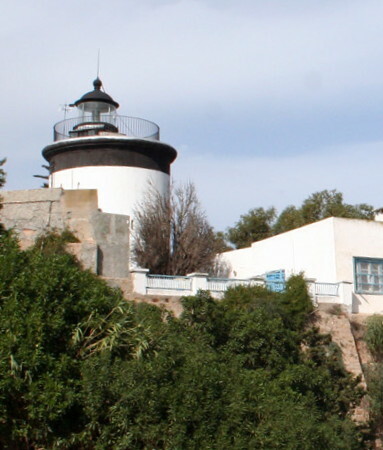 This lighthouse, Tunisia's oldest, stands atop a high hill at the northern entrance to the Bay of Carthage (now the Bay of Tunis). The hill is called Jebel el-Manar, "Fire Mountain," because fires were built here as long ago as Phoenician times to guide sailors into the bay. The Moslem saint Abu Said Ibn Khalef Ibn Yahia el-Beji, who was called Bou Saïd, was buried here in 1231, making this a famous place of pilgrimage. Located near La Marsa, about 20 km (13 mi) northeast of Tunis. Site open, tower closed. ARLHS TUN-012; Admiralty E6412; NGA 22040. Date unknown (station established 1850). Active; focal plane 13 m (43 ft); three white flashes every 12 s. 10 m (33 ft) lantern, gallery, and watch room mounted on four concrete legs. The legs are unpainted; lantern, gallery and watch room painted green. Google has a satellite view. La Goulette is the commercial port of Tunis. The light is located at the end of the main pier, so there should be a good view from arriving cruise ships and trans-Mediterranean ferries. Site open, tower closed. Admiralty E6396; NGA 21996. Date unknown. Active; focal plane 59 m (194 ft); white flash every 4 s. 8 m (26 ft) square cylindrical tower with lantern and gallery. Lantern and top of tower painted black, rest of tower white. A distant view is available, and Google has a satellite view. The islands of Zembra and Zembretta lie off the northwest side of the Cap Bon peninsula; they were declared an international biosphere reserve in 1977. Located about 12 km (7.5 mi) west of Cap Bon. Accessible only by boat. Site and tower closed. ARLHS TUN-028; Admiralty E6394; NGA 21988. 1875. Active; focal plane 126 m (413 ft); three white flashes every 20 s. 20 m (66 ft) tower with lantern and gallery, attached to the seaward side of a keeper's house. Lantern and top of tower painted black, rest of tower white. Claußen has a distant view, Jacques Morin has a very distant view, and Google has a satellite view. Cape Bon is at the narrowest point of the Mediterranean Sea; from here it is only 145 km (90 mi) northeast to Sicily. Located atop a steep bluff at the extreme northeastern corner of Tunisia. Site status unknown. ARLHS TUN-006; Admiralty E6392; NGA 21984. 1888. 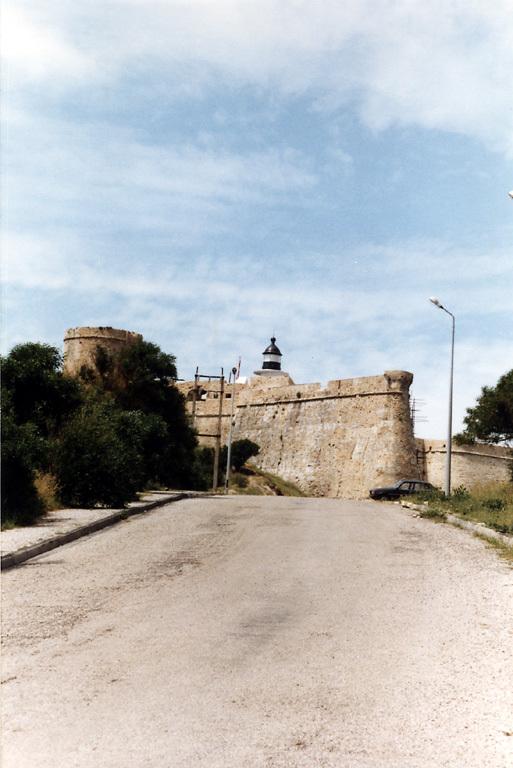 Active; focal plane 82 m (269 ft); four white flashes every 20 s. 18 m (59 ft): square tower with lantern mounted on the east bastion of the Kélibia fortress. Tower painted white, lantern black. Tore Kjeilen's photo appears at right, a similar 2008 photo is available, Wikimedia has a photo, Frank Trieu has a street view from the other end of the fort, and Bing has a satellite view. Built in the late 6th century, the great fortress of Kélibia crowns a hill near the northeasternmost point of Tunisia, with a spectacular view of the central Mediterranean. Located at Qulaybiyah near the eastern point of the Cap Bon peninsula. Site and fortress open, tower closed. ARLHS TUN-001; Admiralty E6390; NGA 21980. Date unknown. Active; focal plane 6 m (20 ft); red flash every 5 s. Approx. 7 m (23 ft) round concrete tower with gallery, painted red. Michael Schwarzer has a photo, another photo is available, and Google has a satellite view. We need information on the history of this lighthouse. Located at the end of the old south jetty, now within the protected harbor of Beni Khiar, about 15 km (9 mi) northeast of Hammamet. Probably accessible by walking the jetty, but if not the lighthouse can be seen from nearby. Site open, tower closed. Admiralty E6389.8. 1912. Active; focal plane 17 m (56 ft); two white flashes every 6 s. 14 m (46 ft): white cylindrical lantern atop the wall of the Kasbah (citadel). Trabas has a closeup, Wikimedia has a photo, Lightphotos.net has a photo, Claußen also has a photo, and Google has a satellite view. Located in Hammamet, at the base of the Cap Bon peninsula about 100 km (60 mi) southeast of Tunis. Site open, tower closed. ARLHS TUN-029; Admiralty E6386; NGA 21976.5. 2009(?). Active; focal plane 17 m (56 ft); two long (2.5 s) white flashes every 15 s. Lantern mounted atop a 3-story harbormaster's office building. Alexey Vovkotrub has a photo, and Google has a satellite view. Port Yasmine is a recently-developed yacht harbor about 13 km (8 mi) southwest of Hammamet. Located on the east side of the harbor entrance. Site and building open. Site manager: Port Yasmine Hammamet. Admiralty E6386.1; NGA 21976.51. Date unknown. Active; focal plane 12 m (39 ft); white or red light, depending on direction, occulting once every 4 s. 8 m (26 ft) round masonry tower, upper half painted red, lower half white. Lightphotos.net has another photo, and Google has a satellite view. Located at the end of the main breakwater mole of Sousse. Site and tower closed. Admiralty E6384; NGA 21952. Date unknown. Active; focal plane 10 m (33 ft); green light, 2 s on, 2 s off. 8 m (26 ft) round masonry tower, painted green. No photo available, but Google has a satellite view. Located at the end of the north pier of Sousse. Site and tower closed. Admiralty E6385; NGA 21960. Date unknown. Active; focal plane 10 m (33 ft); red flash every 5 s. 8 m (26 ft) round masonry tower, painted red. No photo available, but Google has a satellite view. Located at the end of the south pier of Sousse. Site and tower closed. Admiralty E6385.5; NGA 21964. 1890. Active; focal plane 70 m (230 ft); white flash every 4 s. 22 m (72 ft) 2-stage square tower with lantern rising from one corner of the Kasbah (citadel). Lantern painted white. 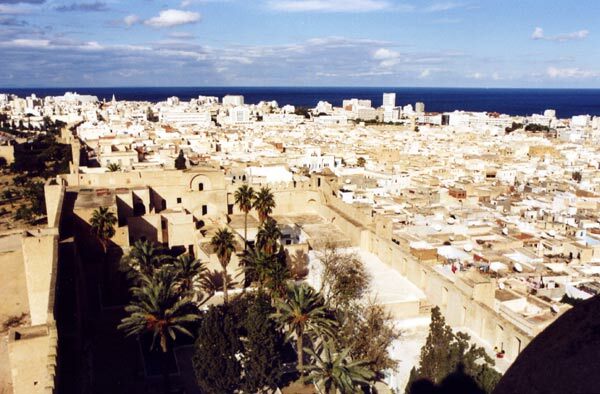 Ad Mesken's photo is at right, Guyomard and Carceller have a photo by Étienne Mercier, Claußen has a photo, Wikimedia has a photo, another photo of the Kasbah shows the lighthouse, there's a view from the top of the tower, Huelse has a postcard view, and Google has a satellite view. This tower, known as Khalef al Fata, is said to have served as lighthouse as early as 859 AD. Located on the highest point of Sousse. Site open, tower reported (in 2004) to be open by arrangement with the keeper. ARLHS TUN-019; Admiralty E6382; NGA 21956. Date unknown (station established 1888). Active; focal plane 26 m (85 ft); two red flashes every 6 s. 6 m (20 ft) tower, described by NGA as a "minaret with black bands on east and south face." However, photos show what appears to be a lantern atop a fortified building. Nawress Nebli also has a photo, and Google has a street view and a satellite view. Located near the fishing port in Monastir. Site open, tower closed. ARLHS TUN-031; Admiralty E6374; NGA 21932. Date unknown. Active; focal plane 8 m (26 ft); two long (2.5 s) white flashes every 15 s. 6 m (20 ft) round white masonry or concrete tower. Wikimedia has a good photo, and Google has a satellite view. Located at the end of the west (main) breakwater of Sayada, a fishing port about 15 km (9 mi) southeast of Monastir. Accessible by walking the pier. Site open, tower closed. Admiralty E6373.22; NGA 21924. 1894. Active; focal plane 30 m (98 ft); flash every 5 s, red to the north and white to the south. 26 m (85 ft) square masonry tower with lantern and gallery, rising from a 1-story keeper's house. Lighthouse painted white with the upper portion of the tower, lantern, and gallery painted red. Habib M'henni's closeup photo is at right, Wikimedia has a distant view, and Google has a satellite view. Kuriat or Qurayyat is a small, uninhabited island about 20 km (13 mi) east of Monastir and 32 km (20 mi) north of Mahdia. Accessible only by boat. Site probably open, tower closed. ARLHS TUN-002; Admiralty E6380; NGA 21920. 1890. Active; focal plane 26 m (85 ft); red flash every 5 s. 15 m (49 ft) hexagonal cylindrical cast iron tourelle with lantern and gallery, mounted atop the keeper's house. Lantern and top of the tower painted red, the rest of the tower white. A photo by Gorik François appears below right, a 2008 photo is available, Claußen has photos, and Google has a satellite view. Mahdia was the capital of Tunisia during the Middle Ages; today the ancient town is a popular tourist attraction. Located on the point of Cap Afrique, a very sharp promontory in Mahdia. Site open, tower closed. ARLHS TUN-013; Admiralty E6370; NGA 21904. Date unknown. Active; focal plane 13 m (43 ft); three green flashes, in a 2+1 pattern, every 10 s. 8 m (26 ft) concrete post light attached to a square 1-story equipment shelter. Entire lighthouse is green. No photo available, but Google has a satellite view. Located on the south (main) breakwater of the fishing port of Salakta. Site and tower closed, but the light can be seen easily from the waterfront. Admiralty E6369.8. Date unknown. Active; focal plane 13 m (43 ft); red flash every 4 s. 8 m (26 ft) concrete post light attached to a square 1-story equipment shelter. Entire lighthouse is red. No photo available, but Google has a satellite view. Located on the west breakwater of the fishing port of Salakta, about 12 km (8 mi) south of Mahdia. Site and tower closed, but the light can be seen easily from the waterfront. Admiralty E6369.81. Date unknown. Inactive. The light was mounted on a short skeletal mast atop a historic tower, the Borj Khadija, the sole surviving tower of a Byzantine era castle. Wikimedia has a photo and a closeup of the top of the tower, Ahmed Moussa has a street view taken from the top of the tower, and Google has a satellite view. 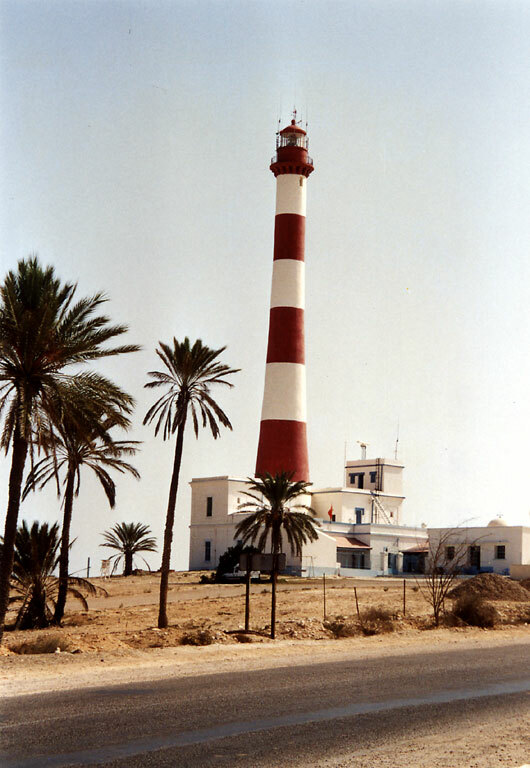 This lighthouse stands at the northern end of the Gulf of Gabès and marks the southern approach to the channel between the mainland and the island of Gharbi. In recent years the light was moved to a nearby mast (next entry), but the original light remains. Located on the point of Ra's Kaboudia near Chebba. Site status unknown. ARLHS TUN-011. Date unknown. Active; focal plane 28 m (92 ft); two flashes every 9 s, red for ships approaching from the south and white for those approaching from the north. 18 m (59 ft) steel mast, painted with red and white horizontal bands and carrying a large topmark. The tower appears in Ahmed Moussa's photo sphere taken from the top of the Borj Khadija, and it appears behind the Borj Khadija in another photo, but it is not very conspicuous in Google's satellite view. Located a short distance northeast of the Borj Khadija. Site status unknown. Admiralty E6368; NGA 21900. Date unknown. Active; focal plane 18 m (59 ft); white light, occulting twice every 8 s, intensified along the range line. 17 m (56 ft) square tapered skeletal tower mounted on a 1-story rectangular equipment building. Tower painted black. and Google has a satellite view. The light guides vessels in the entrance channel of Sfax harbor. Located on the Sfax waterfront. Site status unknown, but the tower must be easy to see from nearby. Admiralty E6362; NGA 21848. 1895. Active; focal plane 55 m (180 ft); white flash every 5 s. 44 m (144 ft) round tapered conical masonry tower with lantern and gallery, attached to a 2-story keeper's house. 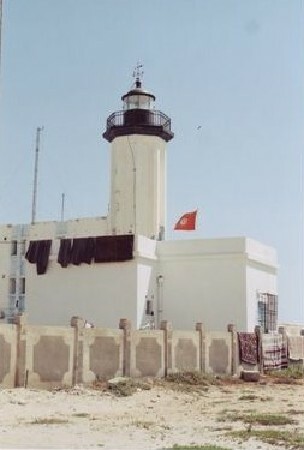 Lighthouse painted with red and white horizontal bands; lantern is red. A photo is at right, Lightphotos.net has an excellent 2009 photo, another photo is available, Huelse has posted a historic postcard view, and Google has a satellite view. The lighthouse was repainted in 2015. Sibling of the Ra's Taguerness Light on Djerba. Ruins of the Roman city of Thaenae are near the lighthouse. Located on a headland at Thyna about 15 km (9 mi) southwest of Sfax. Site status unknown. ARLHS TUN-009; Admiralty E6359; NGA 21836. Date unknown (station established 1895). Active; focal plane 32 m (105 ft); green flash every 3 s. Approx. 30 m (98 ft) "pylon on house," according to NGA. No photo available, but the shadow of the tower is seen in Google's satellite view. La Skhirra is Tunisia's largest oil terminal, shipping oil from fields in both Tunisia and adjacent regions of Algeria. Located about 1.2 km (3/4 mi) northwest of the base of the main pier at La Skhirra. Site status unknown. Admiralty E6354; NGA 21828. 1895. Inactive for many years. Approx. 7.5 m (25 ft) square cylindrical masonry tower with lantern and gallery rising from one corner of a 1-story building. Lighthouse Digest has a historic photo, and Google has an indistinct satellite view. Endangered: the lighthouse is abandoned and deteriorating. Located at the traditional port of Skhirra, about 8 km (5 mi) southwest of the oil terminal. Site open, tower closed. ARLHS TUN-027; ex-Admiralty E6354. 1893. 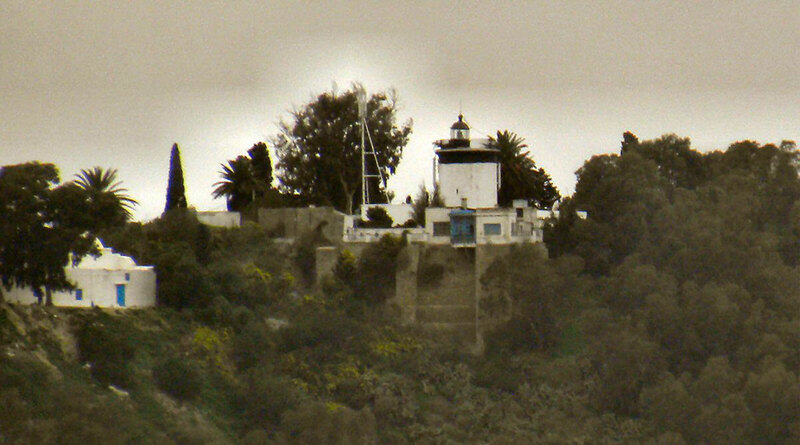 Active; focal plane 13 m (42 ft); two white flashes every 6 s. 11 m (36 ft) octagonal cylindrical fluted tower with lantern and gallery, attached to a 1-story keeper's house. Tower painted white, lantern and gallery black. Lightphotos.net has an excellent photo, Huelse has posted a historic postcard view, and Google has a street view and a satellite view. Located at Gabès, an oasis town and seaport on the Gulf of Gabès. Site open, tower status unknown. ARLHS TUN-018; Admiralty E6348; NGA 21820. Note: The Medenine governate includes Djerba, a large island off the southern coast of Tunisia. The island has a population of about 120,000 and is a very popular tourist destination and beach resort. The island is accessible by frequent ferries from Ajim and by a long causeway (dating to Roman times) at Kantara. 1895. Active; focal plane 16 m (52 ft); red flash every 4 s. 12 m (39 ft) octagonal tower with lantern and gallery, rising from a 2-story keeper's house within a small fortress. Tower painted white, lantern and gallery black. A 2010 photo of the light in action is available, Guyomard and Carceller have a distant view by Danièle Guyomard, and Google has a satellite view. Located at the northwest corner of the island of Djerba. Site status unknown. ARLHS TUN-022; Admiralty E6338; NGA 21780. 1895. Active; focal plane 64 m (210 ft); white flash every 5 s. 49 m (161 ft) round tapered conical tower with lantern and gallery, attached to 2-story keeper's house. 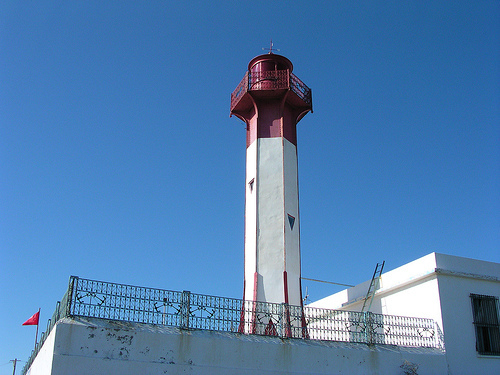 Lighthouse painted with red and white horizontal bands; lantern is red. Henning Leweke's photo is at the top of this page, Wikimedia has several good photos, Trabas has a photo, Richard Voegtlin has a photo, Guyomard and Carceller have a portfolio of photos by Danièle Guyomard, and Google has a street view and a satellite view. 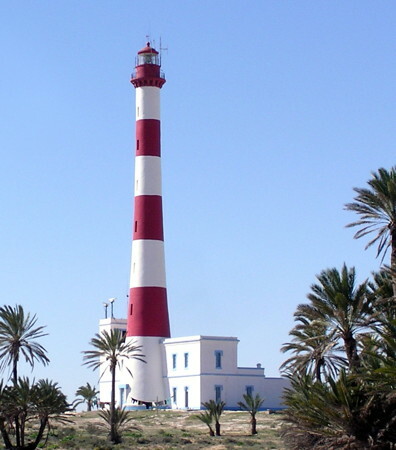 This lighthouse marks the easternmost point of Djerba. Located about 20 km (13 mi) southeast of Houmt-Souk. Accessible by road. Site open, tower closed. ARLHS TUN-010; Admiralty E6332; NGA 21764. Date unknown. Active; focal plane 7 m (23 ft); white flash every 4.5 s. 7 m (23 ft) round cylindrical concrete tower with gallery. Lighthouse painted red with a single white horizontal band near the base. A photo is available, Guyomard and Carceller have a photo by Danièle Guyomard, and Google has a satellite view. Located at the end of the jetty at Arghir, a small port on the southeastern coast of Djerba. Accessible by walking the pier. Site open, tower closed. Admiralty E6330.2; NGA 21760. 1894. Active; focal plane 15 m (49 ft); white light, occulting three times, in a 2+1 pattern, every 12 s. 14 m (46 ft) octagonal cylindrical fluted tower with lantern and gallery, attached to a 1-story keeper's house. Tower painted white, lantern and gallery black. A contributed photo is at right, and Google has a satellite view. Zarzis, called Gergis in ancient times, is a seaport in southernmost Tunisia. Located at the base of the breakwater of Zarzis. Site open, tower closed. ARLHS TUN-020; Admiralty E6328; NGA 21740. Posted July 21, 2005. Checked and revised March 27, 2018. Lighthouses: 42. Site copyright 2018 Russ Rowlett and the University of North Carolina at Chapel Hill.